We are now well and truly inundated with fruit and vegetables from the garden. Each day sees more trays of tomatoes, bags of beans, and tubs of zucchinis being picked. We do sell some to locals, but we are always on the look out for ways to use up the vegetables in tasty ways, so we can take advantage of the glut of fresh food while we have it. Eating seasonally as we do, this is the time of year when we have the most variety. We are almost spoiled for choice. Unfortunately this choice can be overwhelming at times. At the end of a long day it can be hard to know what to make. I’m trying to pack as many vegetables in as possible, but still make the meal tasty and interesting. 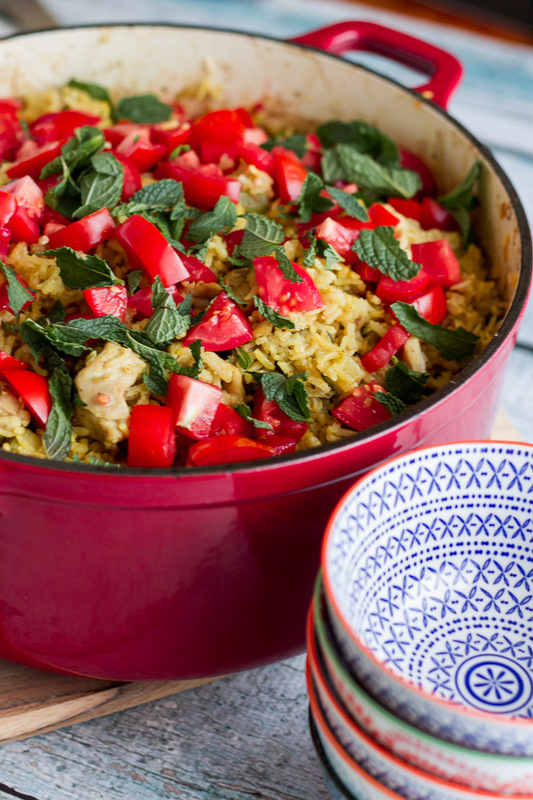 This curried chicken and vegetable pilaf is a classic way to use up lots of vegetables. I made a double quantity yesterday and popped half in the fridge for dinner tonight. With a busy week ahead of us, having dinner already made is always a win in my book. 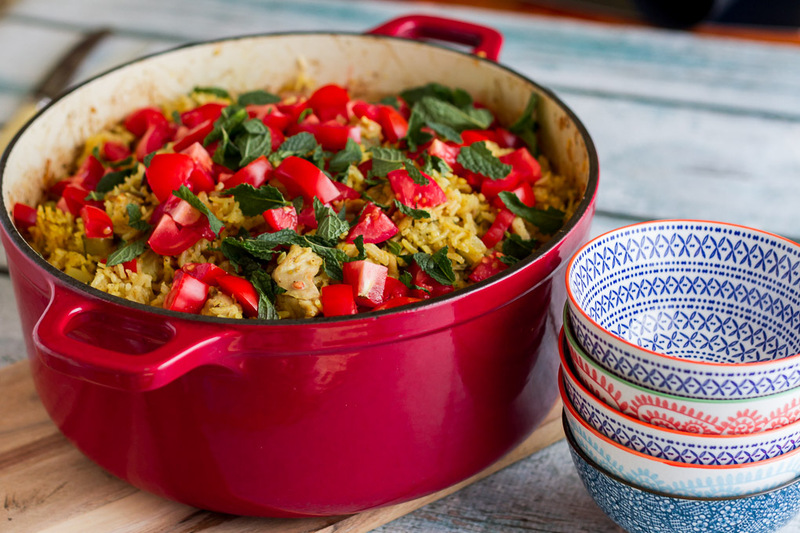 The pilaf is delicious served with a big dollop of peach chutney. If you don’t have peach chutney, another fruit chutney would also be good. 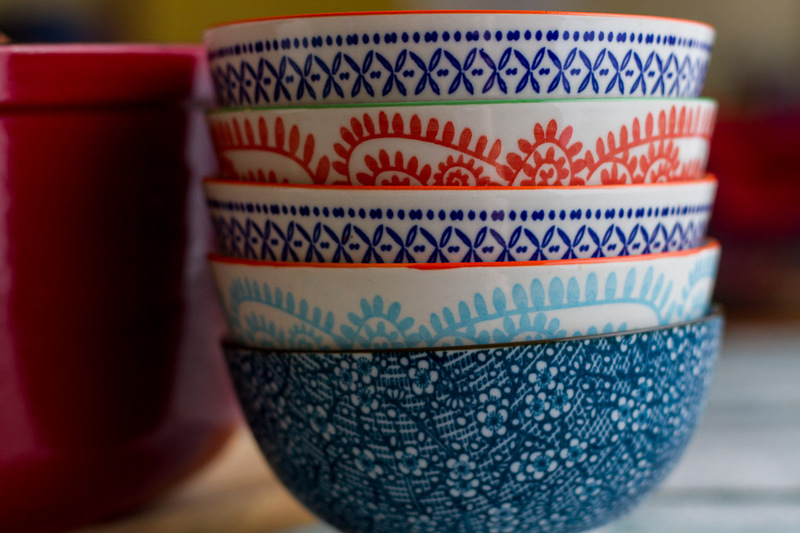 Unrelated, but don’t you just love these bowls? I picked them up in the dollar store in town last year – going against all my advice about not impulse purchasing stuff. I do love their bright colours and patterns. Cut the thigh fillets into 8 pieces. Brown the chicken and then remove from the pan. Add in the onion and korma paste and fry gently for a few minutes. Add in the diced vegetables and fry for another few minutes. Add in the rice, chicken, and stock. Stir, cover, and place in a 150*c oven for 30 minutes or until all the moisture has been absorbed and the rice is soft. 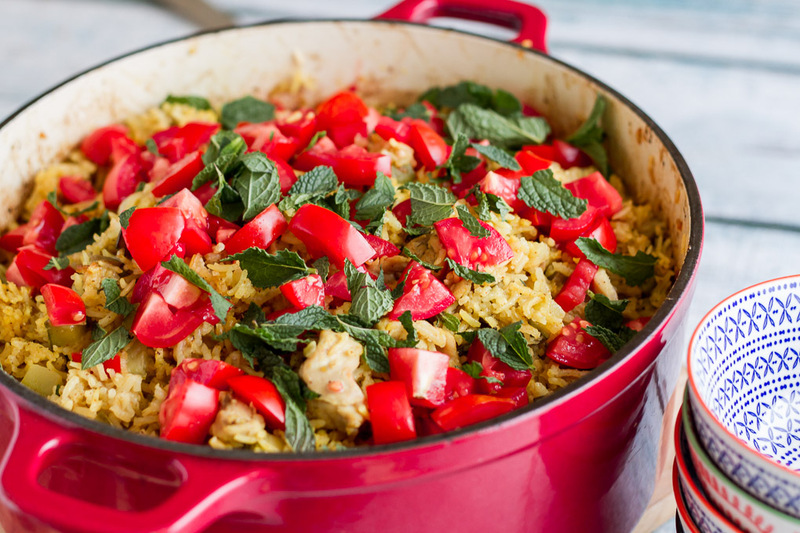 If the rice is not soft but there is no stock left, add a little more and continue to cook. When the rice is soft, remove from the oven, and allow to sit for another 10 minutes. Got any good ways to use up tonnes of vegetables? Share away! – I should write a cookbook someday to share all these recipe. Oh to have your problem hun, seriously how fabulous! This dish looks the business too. I love everything about this meal and your pretty bowls too. I’ve pinned it to make later on. Thanks so much for sharing it on YWF too.